My little children, I am writing these things to you so that you may not sin. But if anyone does sin, we have an advocate with the Father, Jesus Christ the righteous; and he is the atoning sacrifice for our sins, and not for ours only but also for the sins of the whole world. 1 John 1-2:2. Already within a generation or two of Jesus’ life, questions arose within the Christian community about the reality of the experience of Jesus. Some had begun to question His humanity, others questioned His divinity, and many questioned exactly what this all meant. In today’s reading from the Lectionary, St. John wrote to address those concerns, writing in the shadow of the Cross. 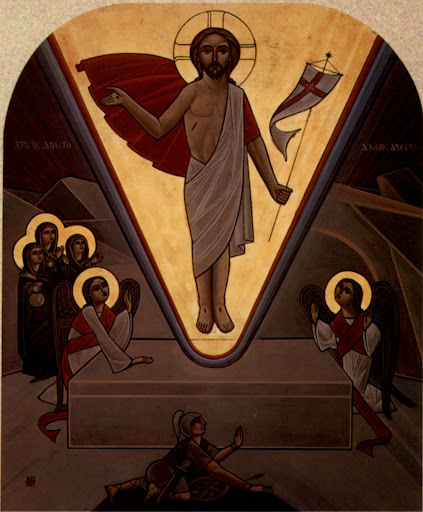 John writes to assure that community, and us, that the resurrection involved a very tangible, physical reality. John and the apostles shared in that divine life. In that remarkable moment, the spiritual world and the physical world collided. St. John tells us that this union, that fellowship, remains available to us all. He addresses a couple of false claims that circulated throughout the Christian community at the time. The first of these was the contention that sin was unimportant. To this first claim, St. John responded that we cannot claim our share in God’s fellowship if we walk in sin. Life with Christ, walking with Christ, will require that we walk in the light, and turn away from the darkness. A number of scriptural passages refer to Jesus’ role as the judge of the world. John offers a more comforting view of Christ: that of an advocate. Advocate may have had legal connotations, suggesting Jesus arguing for us as an attorney might do. I’m inclined, however, to think of Jesus more as a friend who’s been down this road and has my back. 1 John, perhaps more than any other epistle in the Bible, is a love letter. St. John wrote, “Beloved, let us love one another, because love is from God; everyone who loves is born of God and knows God.Whoever does not love does not know God, for God is love. God’s love was revealed among us in this way: God sent his only Son into the world so that we might live through him.” 1 John 4:7-9. The Easter message echoes throughout St. John’s letter. He offers us a vision of Jesus welcoming us home, always ready to forgive, always ready to make a place for us. We need only ask for it, and God’s mercy will fall down around us like a mighty river. This entry was posted in Uncategorized and tagged 1 John 1-2:2., Anglican, Bible, Disciple, Bible, Christianity, Dominican Order, Easter, Episcopalian, Epistle, Forgiveness, Gospel, Incarnation, Jesus, Love, Moral Theology, Religion, Scripture, Spirituality, St. John, Theology. Bookmark the permalink. I am curious to know what John says about guilt and love. While I’m not sure exactly what you’re referring to, in the 21st chapter of John’s Gospel, he describes the ability of love to overcome guilt. It tells the story of the encounter between the resurrected Jesus and Peter, who had denied Jesus three times. The text goes like this: “When they had finished breakfast, Jesus said to Simon Peter, ‘Simon son of John, do you love me more than these?’ He said to him, ‘Yes, Lord; you know that I love you.’ Jesus said to him, ‘Feed my lambs.’ A second time he said to him, ‘Simon son of John, do you love me?’ He said to him, ‘Yes, Lord; you know that I love you.’ Jesus said to him, ‘Tend my sheep.’ He said to him the third time, ‘Simon son of John, do you love me?’ Peter felt hurt because he said to him the third time, ‘Do you love me?’ And he said to him, ‘Lord, you know everything; you know that I love you.’ Jesus said to him, ‘Feed my sheep.” Jesus offers love (feeding his sheep) as a way out of guilt. yes, it gives me a place to start. thanks. Wow! Thank you. I needed that and just at this very moment. I’m so glad you found what you needed. WOW! That was needed by me and at this very moment. Thank you. I believe they are always paired, even when we do not recognize their association. And the diminution of the one, will necessarily diminish the other. I think you’re right. John may be my favorite biblical writer. Thank you so much for the support and encouragement. I have an old picture in my bedroom of someone, presumably Christ, in heaven holding someone in his arms – we can only see that person’s back. I have always taken that to be Christ welcoming us into the Kingdom of God. The Scripture you quoted from 1 John 4: 7-9 is one of my favorites and particularly right now I need the reminder that I too am one of Christ’s beloved. A blessed week to you, my friend, and gratitude for your message once again. One of these days, I’d like to see that picture. Glad the piece spoke to you. Whence comes that icon? It looks vaguely Coptic/Syriac. It’s a modern Coptic icon, which I believe came from St. Takla. In the beginning “God!”….. We declare to you what was from the beginning,… This same Jesus! Good post brother James the word is powerful! He is powerful, and risen, indeed! Many thanks.